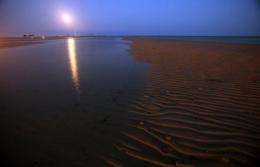 The full moon rises over Biloxi's beach and lighthouse in Biloxi, Mississippi, 2011. Oil giant BP has reached a $7.8 billion (5.9 billion euro) deal to settle thousands of claims from the 2010 Gulf of Mexico oil spill, but some of the victims said Saturday that the money won't bring the disaster to a close. Oil giant BP's agreement of a $7.8 billion settlement for victims of the 2010 Gulf of Mexico oil spill will not end its legal headaches or erase the disaster for some US southern coast residents. "No amount of money will bring him back anyway," Sherri Revette, whose husband, Dewey, was a driller on the Deepwater Horizon oil rig when it exploded on April 20, 2010, told AFP. "It probably got him right from the get-go," she said about her deceased husband, who was sitting almost directly over the blast site. The last-minute deal Friday means a highly anticipated trial will be delayed once again after a postponement was ordered last week to allow settlement talks on what became the worst environmental disaster in US history to continue. "The proposed settlement represents significant progress toward resolving issues from the Deepwater Horizon accident and contributing further to economic and environmental restoration efforts along the Gulf Coast," Bob Dudley, BP's chief executive, said in a statement. A judge's approval is required before the settlement is finalized. The explosion on the BP-leased Deepwater Horizon drilling rig killed 11 workers when flammable gas leaked from the well and ignited. The oil spill that followed blackened beaches in five US states and devastated the Gulf Coast's tourism and fishing industries. It took 87 days to cap BP's runaway well 5,000 feet (1,500 meters) below the water surface as it spewed 4.9 million barrels (206 million gallons) of oil into the Gulf of Mexico. Several government probes have already criticized BP, rig operator Transocean and Halliburton -- which was responsible for the well's faulty cement job -- for cutting corners and missing crucial warning signs. Revette said she wanted the victims' lawsuit to proceed to trial rather than be resolved through settlement. "Everything needs to be brought out," the oil worker's widow said. "We could quit pointing fingers. Each party that was guilty would know their part." A judgment on the evidence would also be more likely to make the oil firms "stop cutting corners," Revette added. David Fouche, a chef at Deanie's Seafood Restaurant in New Orleans, said he still is forced to import jumbo crabs from Venezuela after the spill devastated the local crab and oyster industries. "Prices are just now getting to a level where they're affordable, where we can get into a profit range," he told AFP. His restaurant was paid a settlement from BP but Fouche said it did not cover all its additional expenses. "BP's not going to pony up," he said. Other victims said the settlement might help them move on from the disaster. "It's good they settled," said fisherman and plaintiff Acy Cooper of Venice, Louisiana. "I didn't want to wait no 10 years to get our money. This will be better for our industry." The US Justice Department, however, suggested the settlement is not the end of BP's legal entanglements or payments. "Although we remain open to a fair and just settlement, we are fully prepared to try the case," a spokesman said in a statement. The Justice Department wants to ensure any resolution of damages claims "is just, fair and restores the Gulf for the benefit of the people of the Gulf states," the statement added. The settlement does not affect what is anticipated to be tens of billions of dollars in fines and claims from the US government, coastal states and local governments impacted by the spill. Nor does it resolve suits filed by shareholders or those seeking payouts because of a drilling moratorium imposed after the disaster. Judge Carl Barbier issued an order late Friday adjourning the case indefinitely "because such a settlement would likely result in a realignment of the parties in this litigation... and in order to allow the parties to reassess their respective positions." The case will likely still go to court even if a deal is reached with the federal government, because BP is hoping to shift some of the cost to its subcontractors, which could take years and multiple appeals to resolve. One set of federal fines could reach $18 billion if gross negligence is found. BP faces other economic liabilities from the spill, including the cost of environmental rehabilitation, and could be hit with costly criminal charges and punitive damages ranging from one to five times the cost of compensation.